Wedding bells: Neeti Mohan releases new pre-wedding song 'Kithe Reh Gaya', which relates to her real-life! MUMBAI: We had seen some of biggest Bollywood celebs tying the knot in the year 2018. Now it looks like its Neeti Mohan’s turn now. She has been dating Nihar Pandya for a while now. The two will be making an appearance on The Kapil Sharma’s show. The couple will be getting married on Valentine’s Day 2019. On the work front, Neeti Mohan’s new song Kithe Reh Gaya is all round buzzing and we can’t get enough of the song. Her melodious voice in the track is sure to give you a good vibe while lyrics have been written by Kumaar and music has been given by Abhijit Vaghani. The song is about pre-wedding celebration and completely relates with Neeti’s real life scenario. Also, Nihar Pandya recently made his Bollywood debut in Manikarnika: The Queen of Jhansi. Well, we at Radioandmusic wish the couple hearteous congratulations and we can’t wait to see the couple get married. 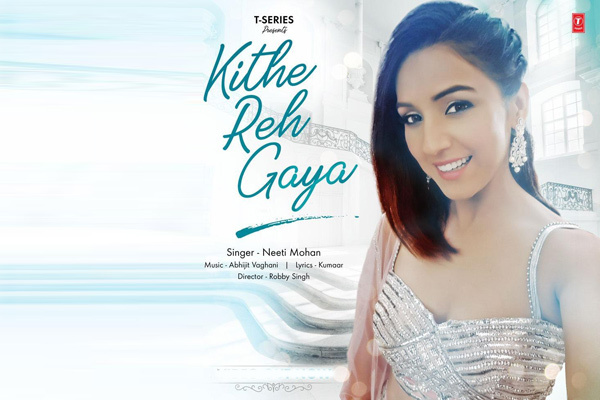 Neeti Mohan last song Kanha Re, which featured her sisters, Mukti Mohan and Shakti Mohan was a pretty successful track and now this track Kithe Reh Gaya is all set to become another hit of Neeti Mohan. MUMBAI: Diljit Dosanjh is proud of his roots in Punjab, but the singer-actor is ready to explore the south Indian film industry as well. "I like south Indian films... the action and all. MUMBAI: National Award winning singer Shashaa Tirupati will soon be coming out with the cover version of O Pardesi, a song from Dev D. The cover is produced, arranged and sung by Shashaa herself and will be released soon on her YouTube channel. MUMBAI: Actor-singer-songwriter Farhan Akhtar who has released his first solo music album titled Echoes, produced by Grammy Award-winning Italian producer Tommaso Colliva, says such collaborations are fruitful for creativity. Anushka Manchanda to march for animal justice! MUMBAI: Amid the many artistes, who have advocated social causes, popular singer Anushka Manchanda, an animal lover, has been vocal about her love for animals time and again.